Hi friends...sharing a sweet little Owl shaped card to wish you a wonderful week ahead. This is my DT post for the Cuttlebugmania Challenge where the theme is "Halloween Animals". I know we are supposed to make scary projects for Halloween featuring spiders , bats and maybe even cats . 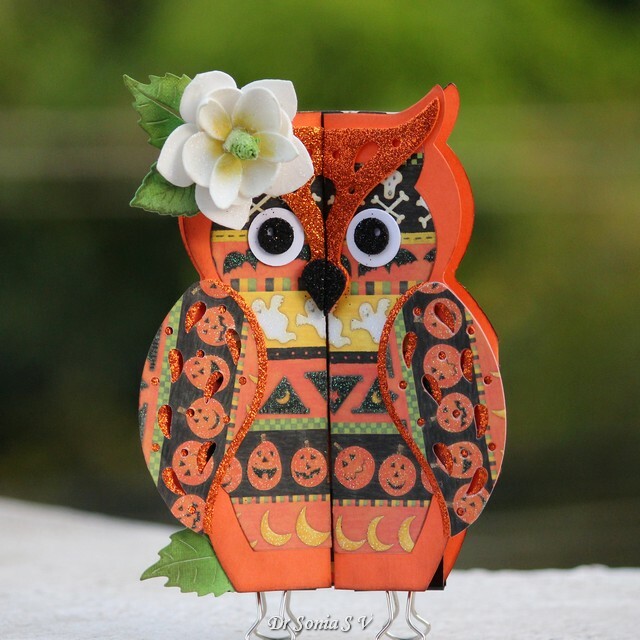 I did use Halloween themed papers to make my owl but she did turn out too cute...what do you say friends!! Hi friends...sharing a basket of bottles!!! 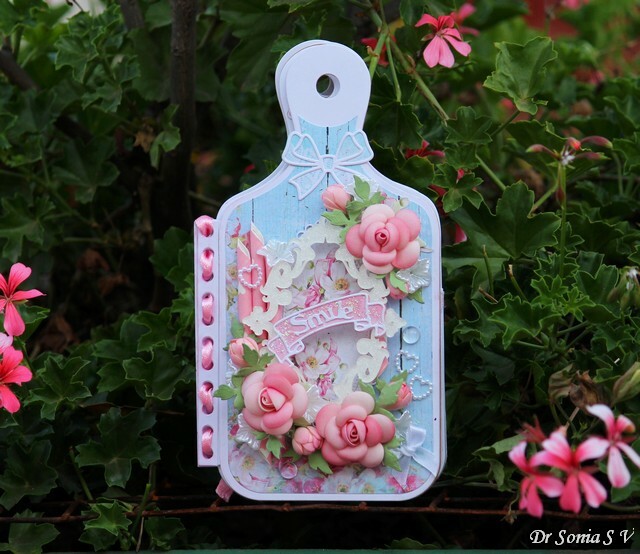 Made using gorgeous bottle shaped dies from Crealies. 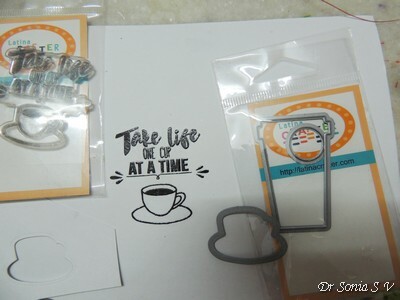 I used the same die set to make a Bottle Shaker Card earlier.The bottles are really huge and are big enough to be used as bookmarks or flashcards. 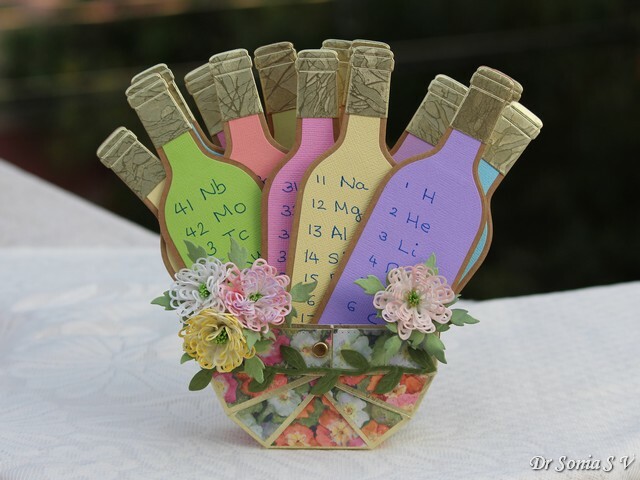 I made a dozen or so bottles and made a cute basket to hold them.This basket is pretty easy to make and perfect if you have to whip up something handmade to hold a special gift .You can easily vary the design and the measurements to fit the size of your gift. Take an 8 x 6 ½ inch card and score on the 8 inch side at 1, 2, 3, 5, 6 and 7 inches. 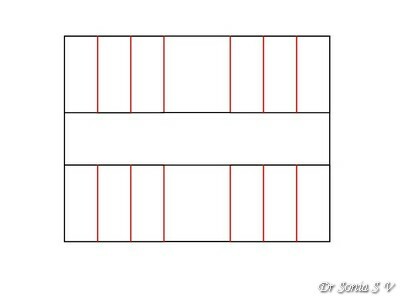 Turn and on the 6 ½ inch side score at 2½ and 4 inches.Cut on the red lines as shown in the picture above and fold along the scorelines. 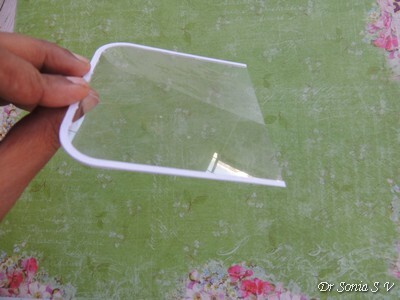 Punch holes as shown above on all six 1 inch rectangles.For a neater finish, round the outer corners of the inner four 1 inch rectangles as shown in the picture above. and secure. Do this on the other side also and your basket is ready! My 12 year old daughter is learning about elements and compounds in Chemistry and is using the Bottle shaped cards as flashcards to help her learn chemical names. 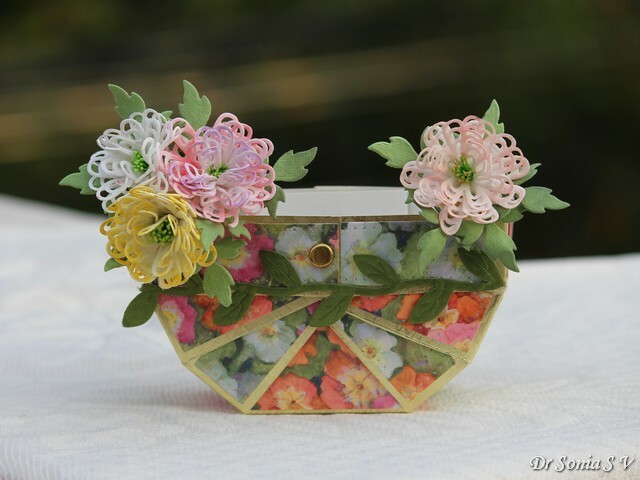 The lacy flowers on the basket were made using foamiran and Crealies dies.The leafy vine is a ribbon. I hope you liked this project idea. 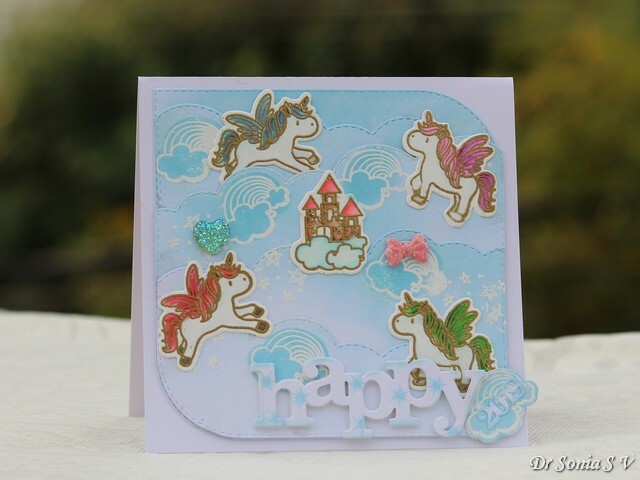 Hi friends...I just love Crealies dies as their designs are always so fun and clever. 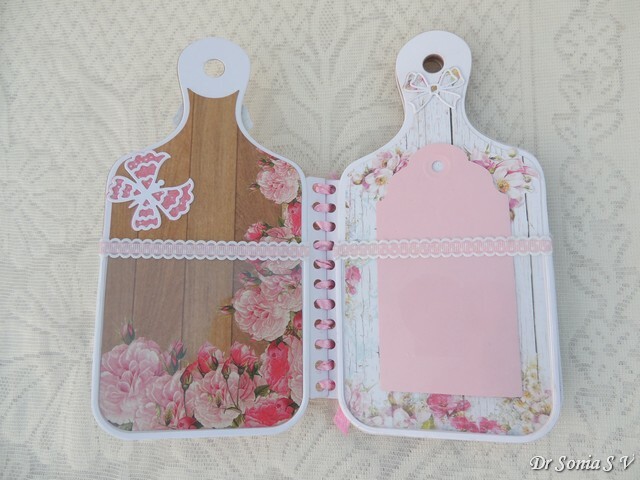 The new release from Crealies has a gorgeous huge die set to make a "cutting/ bread board". 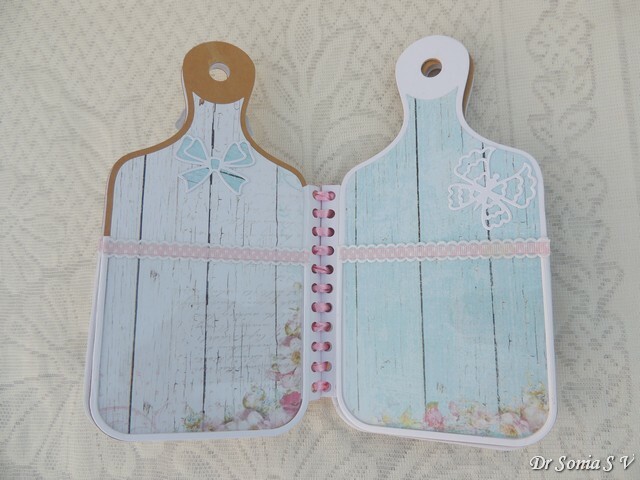 And for my DT post for Crealies I made a Mini Book/Album in the shape of a "cutting board". 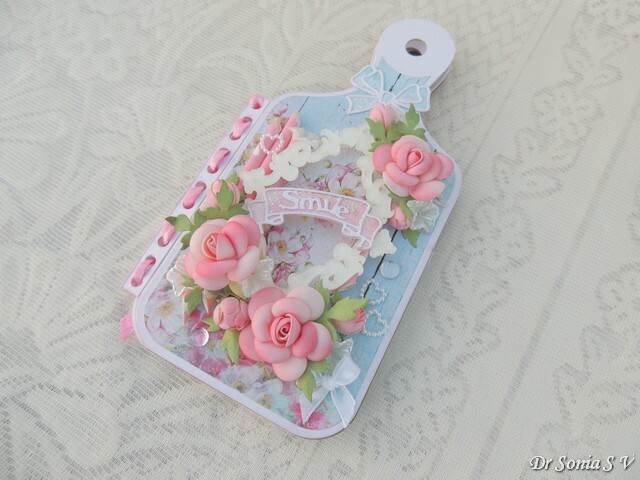 It is 8 inches tall and 4 ¼ inch wide. 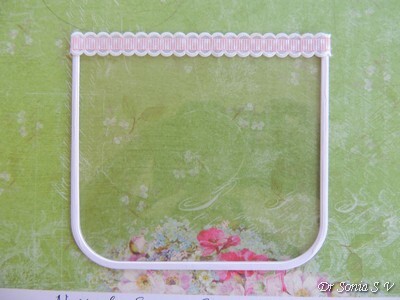 This particular book has 5 sturdy pages bound together with satin ribbon. 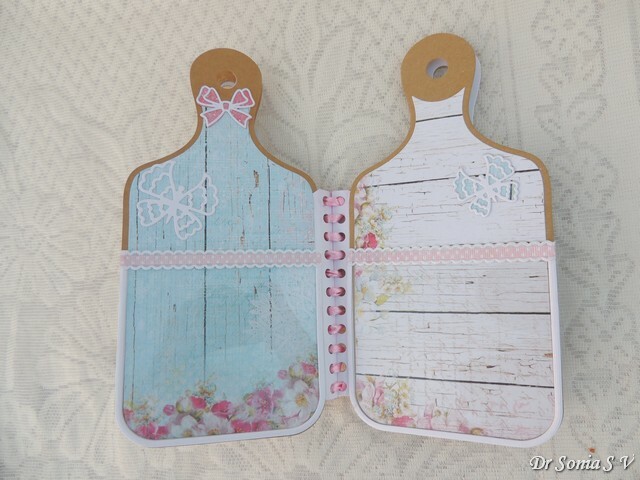 Each page has pockets made out of acetate and you can slip in little "to do lists" , recipes, shopping lists etc. 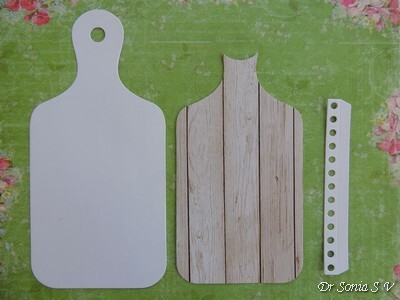 The chopping board pieces were made with the Crealies Cardzz No .11 die set . 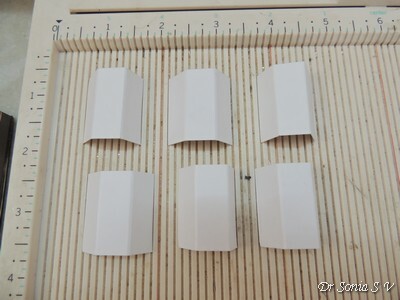 The strip with the holes was made with the new Crealies Only Inside 104 die . 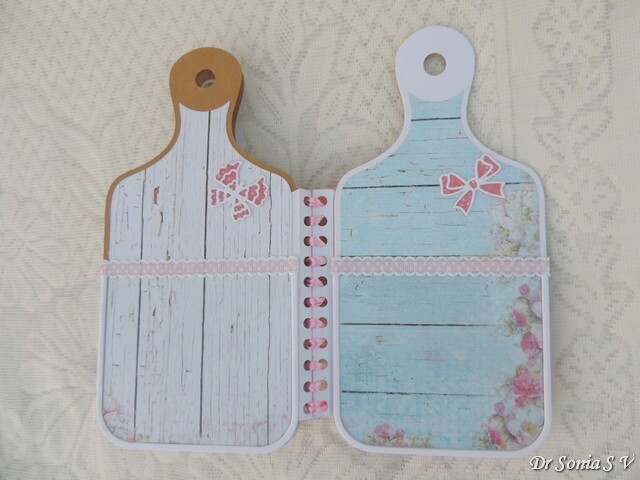 The diecut has a score line between the tab and the holes and this is very useful to line and stick it to any page and make a mini book out of it! I used a simple ribbon in this project...you can alternately use twine, paper ropes or even metal rings. 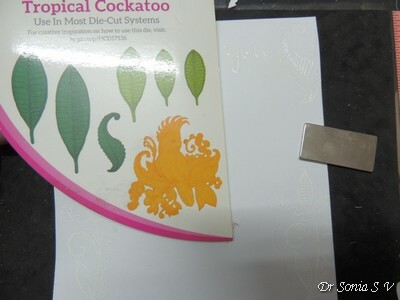 The basic idea is to cut 2 frames from cardstock to sandwich a piece of acetate.The cardstock frame helps give a good adhesion of the acetate pocket to the mini book page. 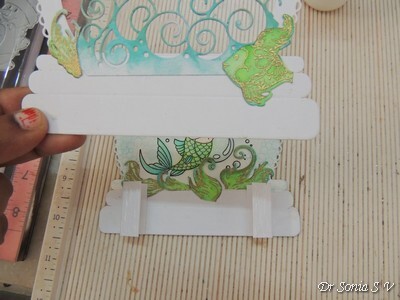 Tape 2 nesting dies together to cut 2 frames from cardstock[You can hand-cut or use any any nesting die you have]. 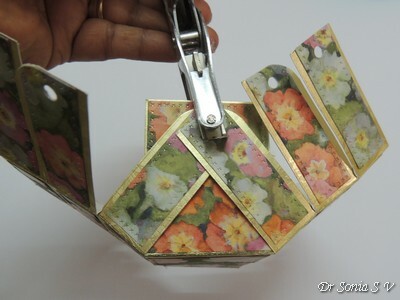 Use the outer die to cut a piece of acetate . 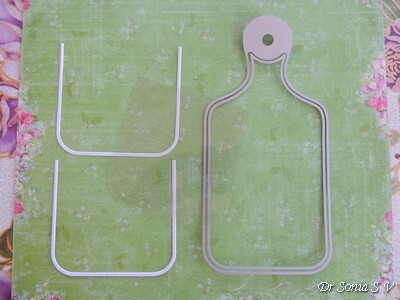 Trim the acetate and the cardstock pieces to the size you want. In this project ,I trimmed the acetate sheets and their cardstock frames to 3.5 inches length. Sandwich the acetate in between the 2 cardstock frames. 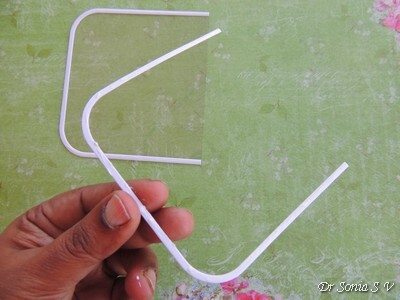 Be very sparing with the glue and go slow taking care not to smear extra glue onto the acetate sheet. 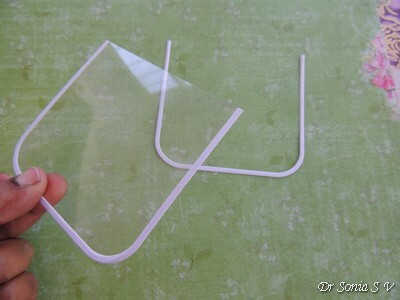 Once you have glues both the frames...wipe off any glue which inadvertently smeared onto the acetate sheet. Add a finishing touch to your pocket using a bit of ribbon or lace. 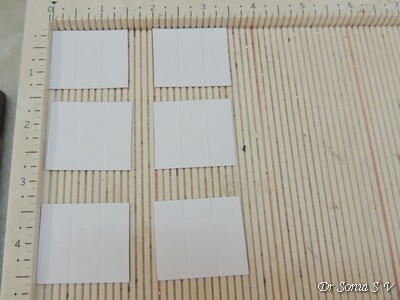 Now your pockets are ready to be added to your mini album pages. If you want a roomier pocket use a foam frame or a double cardstock frame under the acetate sheet. Take care not to use too much glue as you stick on your pockets as now any smearing inside your clear pockets will be very tricky to clean! This particular Mini Book has 5 pages but because of the technique used in its construction you can easily add more pages later on too. You just have to remove the ribbon holding the pages and thread it through again after adding extra pages. 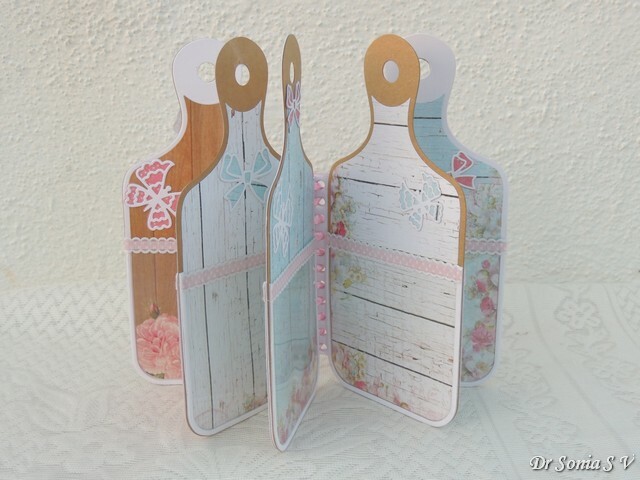 I hope you like this idea using the Bread Board/Cutting Board die and the Mini book making Crealies Only Inside 104 die. Hi friends sharing another festive card featuring an adorable Penguin! The cute little penguin was colored using Zig Watercolor Brush Pens and a sky blue background created using Distress Inks . 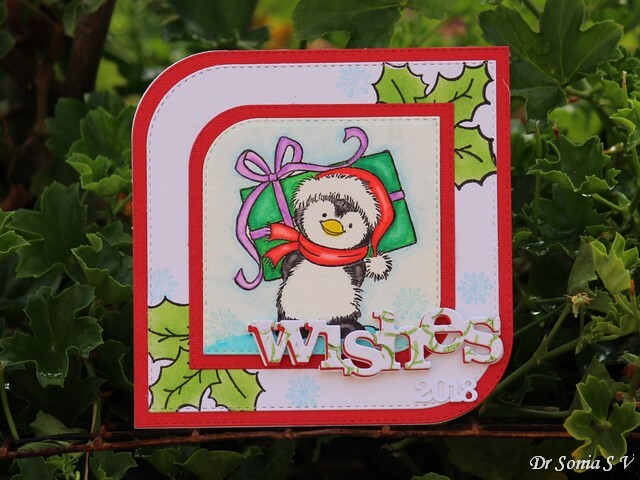 The holly leaves in the background was quickly colored using the coordinating die of the recollections stamp set....in nearly the exact way I used in this Warm Wishes Card. Added a bit of interest to the background stamping tiny snowflakes from winnie and walter and topped it with layered "Wishes" stamped with holly leaves. 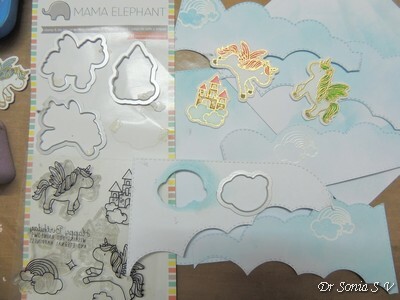 My new found technique of using a coordinating die to color the matching stamp was really helpful to quickly sponge in color and highlight the tiny clouds stamped on the bigger clouds! I am surprised at how cheerful this simple card turned out to be! 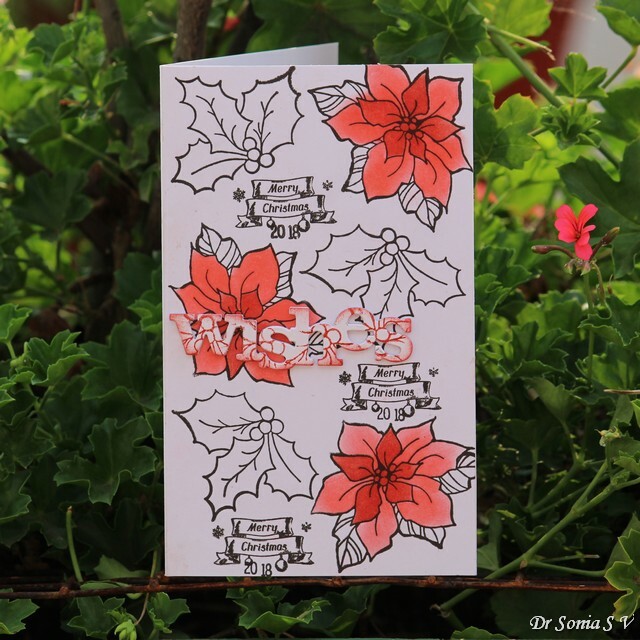 Hi friends sharing a simple floral card in bright and vibrant hues. 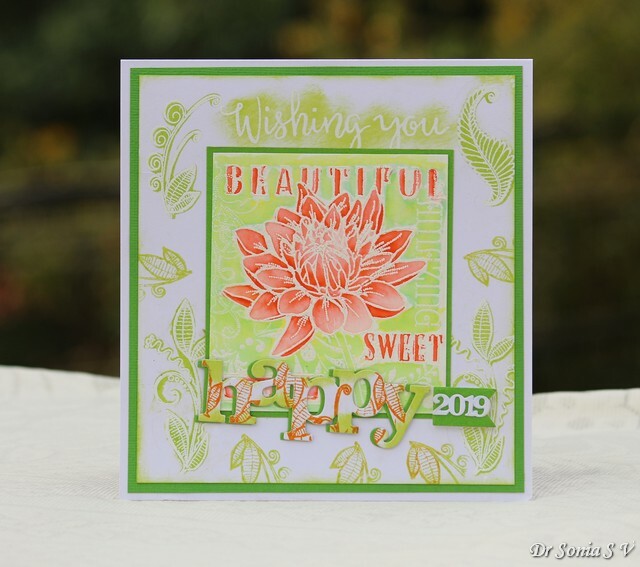 The Dahlia was colored with Zig Watercolor Brush Pens and a background quickly made by stamping and heat embossing leaves from 2 Heartfelt creations stamp plus die sets. 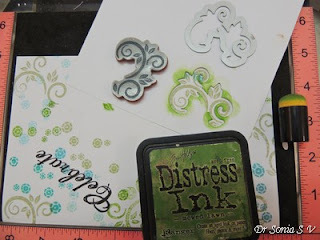 I used the negative die cut aperture to quickly blend in Distress Inks over the stamped leaves...it was such a gratifying and easy way to quickly make a background ! 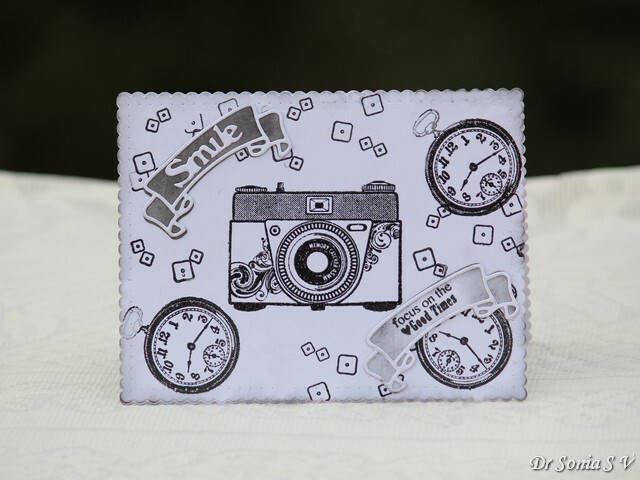 Hi friends...sharing a simple masculine themed card showcasing a Camera with the caption " Smile" and a footnote " focus on the good times" This was a really fun card to put together mixing and matching stamps!! Hi friends.....I am on a card making spree !!! 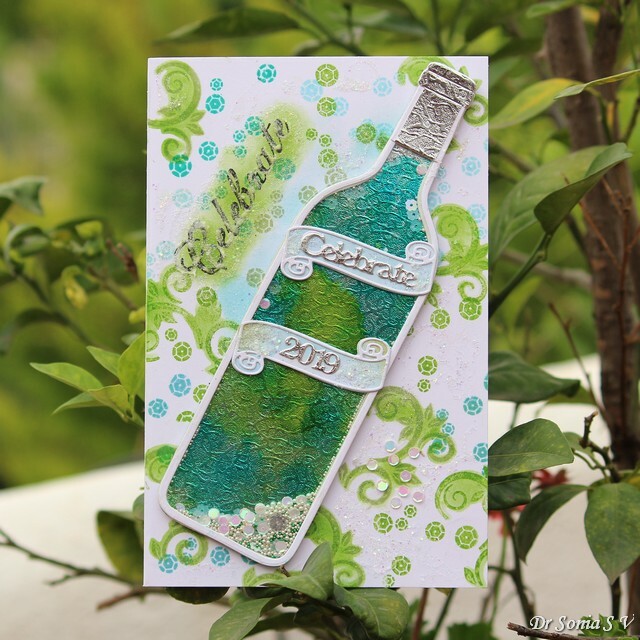 Sharing a fun Bottle shaker card in an aquamarine, lime green and turquoise blue color theme! I was able to achieve the beautiful blend of colors within the bottle by blending alcohol inks on textured silver cardstock. 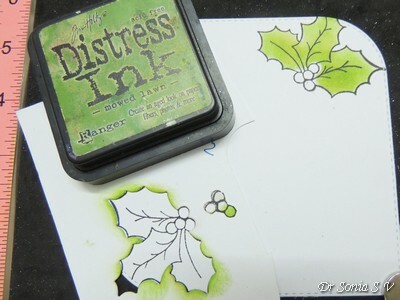 I used the die of the leafy scroll stamp to blend in Distress Inks to color and give a shadow effect to the stamped image...it was fun and the whole card turned out entirely different from what I usually make! 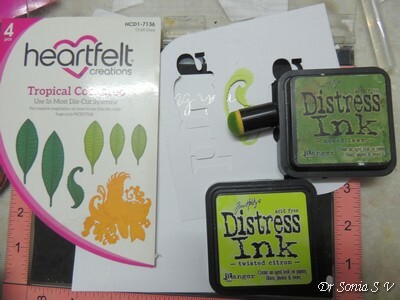 WCMD 2018 Dress Up Die Cuts Challenge with Gayatri- the scroll banner dies were jazzed up with Distress Inks and then glittered. 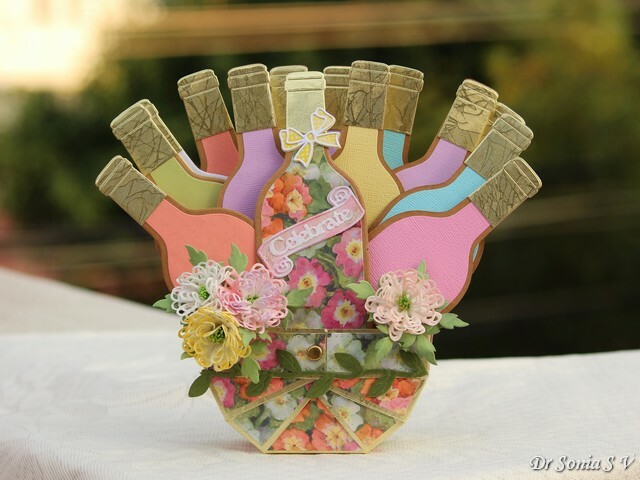 The whole bottle is a die cut dressed up with alcohol inks and shaker elements added within. 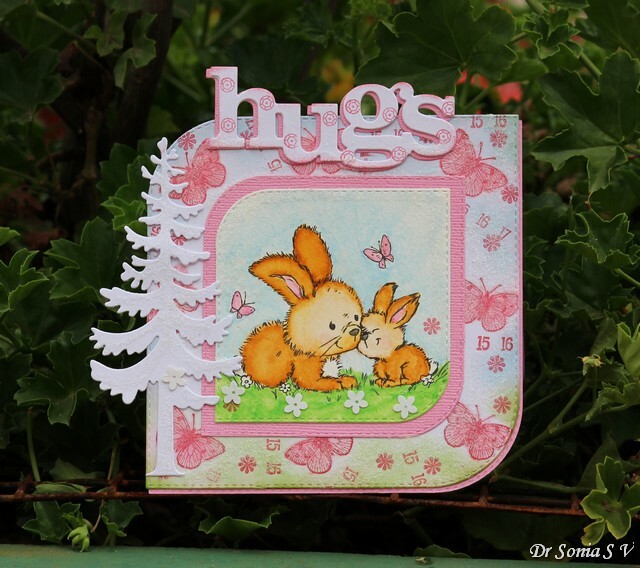 Hi friends happy to share a simple cute card featuring adorable bunnies stamped and watercolored with Zig Watercolor Brush Pens . Used my newly found technique of using the coordinating die to quickly color the stamped butterflies in the background .This was a super fun and quick card to make! WCMD 2018 Dress Up Die Cuts Challenge with Gayatri- stamped sequins on the Hugs diecut, Glittered the Pine tree die cut. 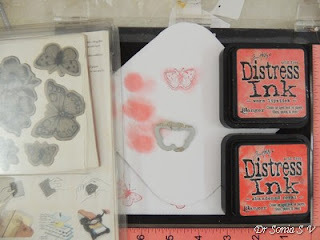 I just love the ease with which you can easily get a two tone flower by blending in Distress Inks through coordinating die cut negatives of stamps. 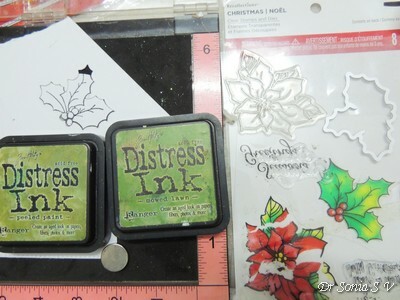 WCMD 2018 Dress Up Die Cuts Challenge with Gayatri- stamped holly leaves and berries from Recollections Christmas Noel Stamps on the "wishes" die cut . Hi friends...sharing a bright and cheerful Winter Wishes card featuring the adorable Winter Fox stamp from Lawn fawn which I had been hoarding for more than a year now! I mixed and matched my stamps to create the card and used the super easy stamp coloring technique using the negative of the coordinating die. 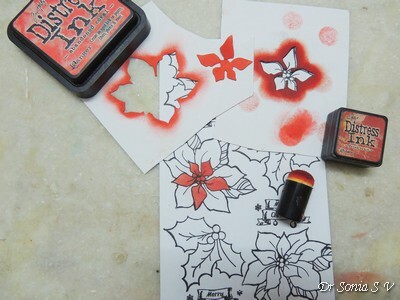 I am so thrilled I tried out this technique ...it is so cool, easy and extremely quick to color stamps using this technique!!! 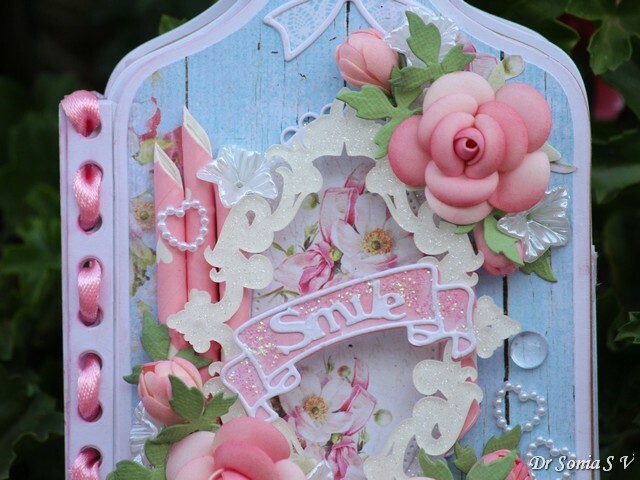 Hi friends....I have really got into the CAS mood and am enjoying myself trying out new designs using supplies I have hoarded for long . 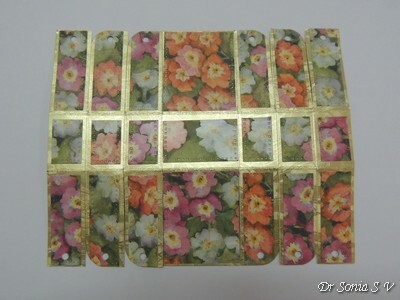 It is a very simple card made by mixing and matching various stamps . The central Cup was colored by blending 2 shades of Distress Inks through the negative aperture of the coordinating cup die. 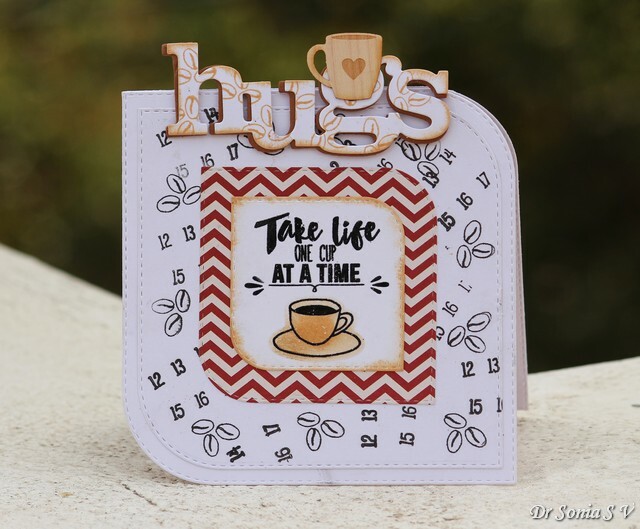 WCMD 2018 Dress Up Die Cuts Challenge with Gayatri- stamped coffee beans on the "hugs" die cut and dressed it up with a wooden cup! 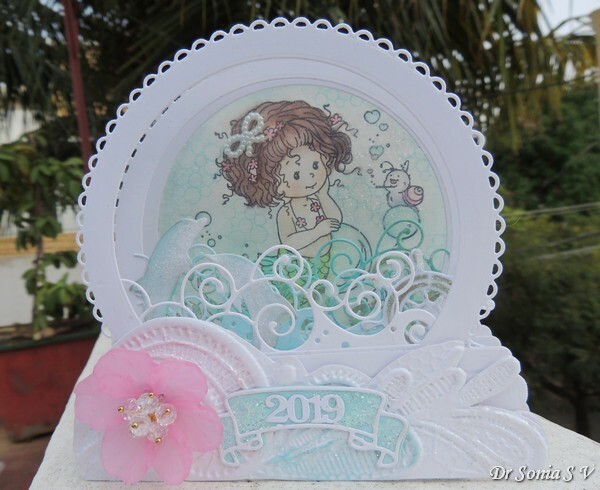 Hi friends...sharing a fun and adorable 3 D Pop Up Card featuring a mermaid swimming amongst the dolphins in the bubbly blue ocean! 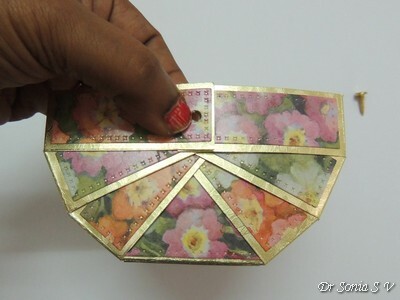 This is a 4 layered 3 D card which folds completely flat for mailing / storage and stands beautifully for display. 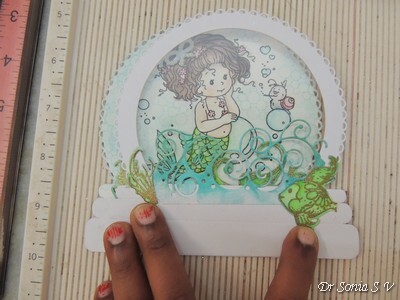 When I first shared this design of a 3 D Snowglobe Card I got so many requests for a Tutorial so for the Tutorial post , instead of making the same card again...I varied the theme , keeping the mechanism the same. Diecut 2-4 snowglobe shapes depending on how many layers you want. 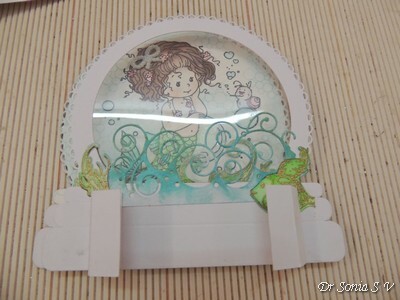 Keep one as it is if you want to stamp on the back most layer and diecut windows in the rest. 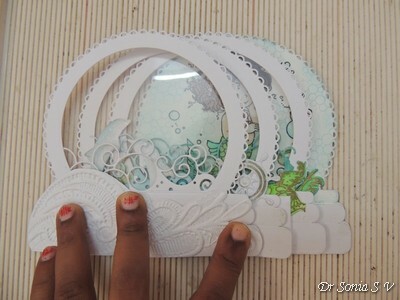 Add acetate to the snowglobe diecuts with windows. 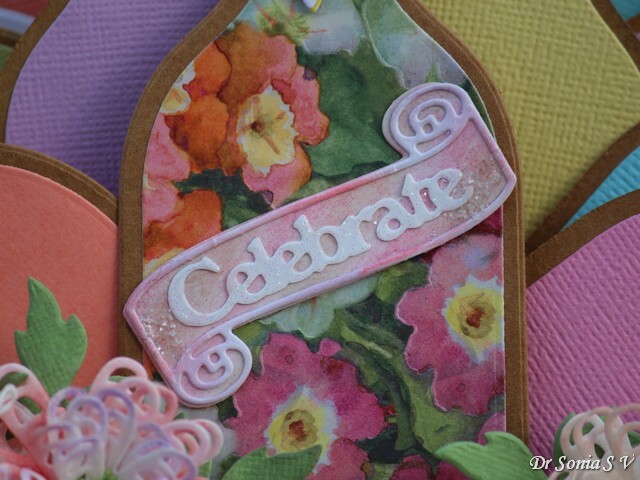 Acetate helps give strength to the layers and is a nice backdrop to stick your diecut/ stamped embellishments. 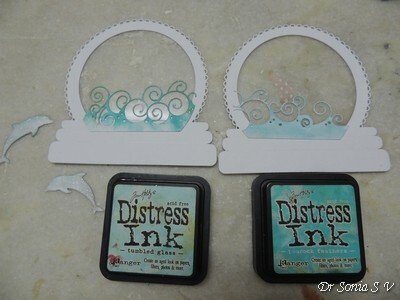 I dressed up Memory Box waves and dolphins with Distress Inks and added them to 2 snowglobe layers. 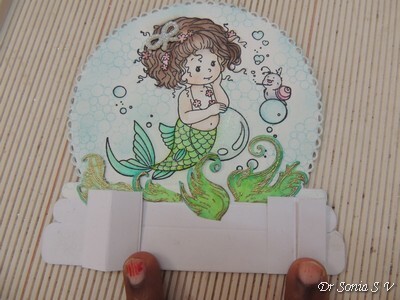 I didn't have any seaweeds but this Heartfelt creations fish stamp had such nice flowing fins which were snipped and used as seaweeds for my little mermaid to swim amongst! 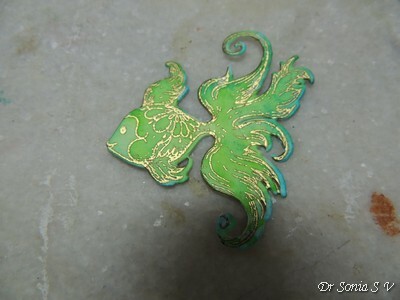 Keep all your elements flat and dont add too many big diecuts/ stamped images. 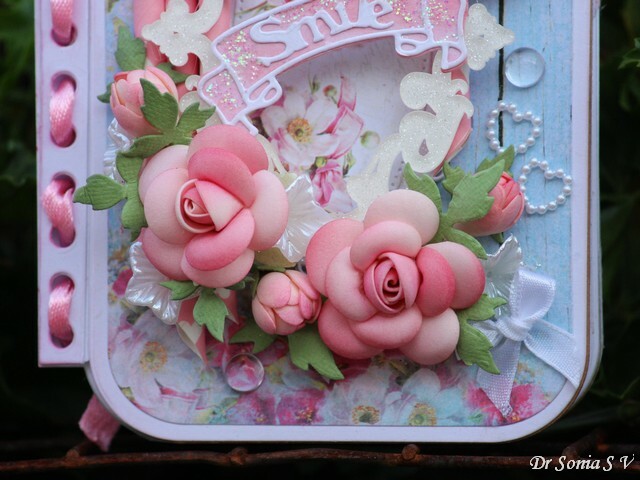 Once you have decorated all your layers you can assemble them. You need one pair of tabs to connect one pair of snowglobes. For a 4 layered 3 D snowglobe you need to make 6 tabs each measuring 1¼ x 1½ inches. Score on the 1½ inch side every ½ inch and fold on the scorelines as shown below. Fold both the tabs towards one side and check again for any jutting edges- correct if anything protrudes beyond the edges. 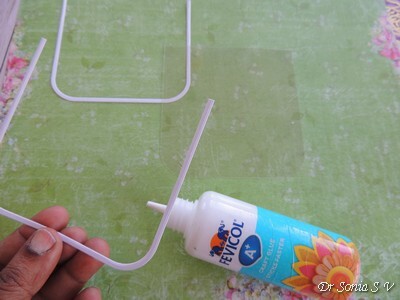 Apply glue to both the tabs as shown below and stick on the next snowglobe layer. When sticking keep the snowglobes in line and gently stick the top layer.And next to get a good secure adhesion and to ensure a perfect pop up mechanism...slide the top layer which you had gently stuck on the tabs underneath towards the side and press---this will take the inside tabs to the side too and ensure a good flat folding 3 D card. Add the next 2 snowglobe layers in exactly the same way by sticking the tabs. The tabs work in such a way that the snowglobe layers will fold flat to both the sides. 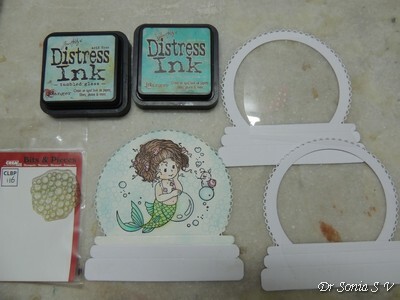 This mechanism can be adapted to create any shaped 3 D card not just a snowglobe but is especially effective in the Snowglobe shape. 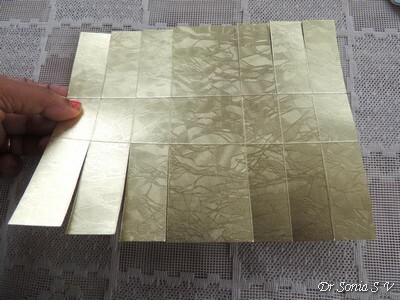 You can also vary the number of layers and make one with just 2 layers if you like. 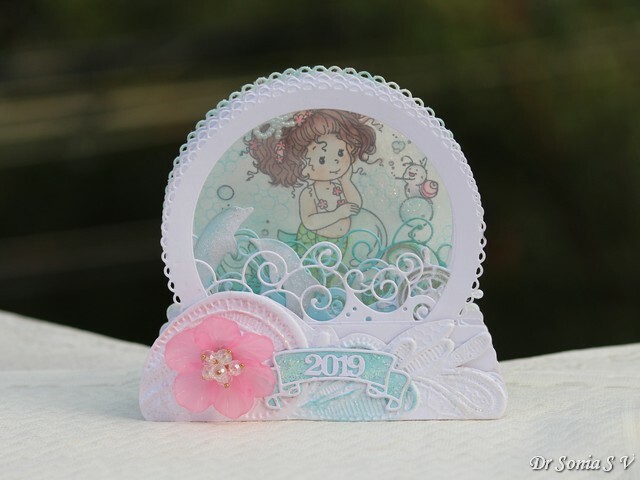 The beautiful wavy design on the outermost layer was created by cutting a card embossed with the Crafters Companion Ornate Lace 3 D Embossing Folder. 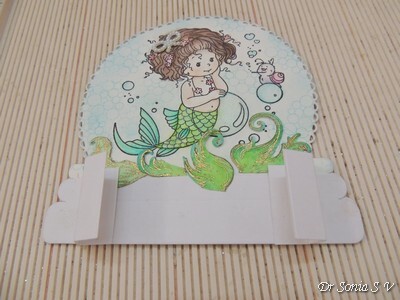 I hope you liked this 3 D card Tutorial and Mermaid themed Snwoglobe . 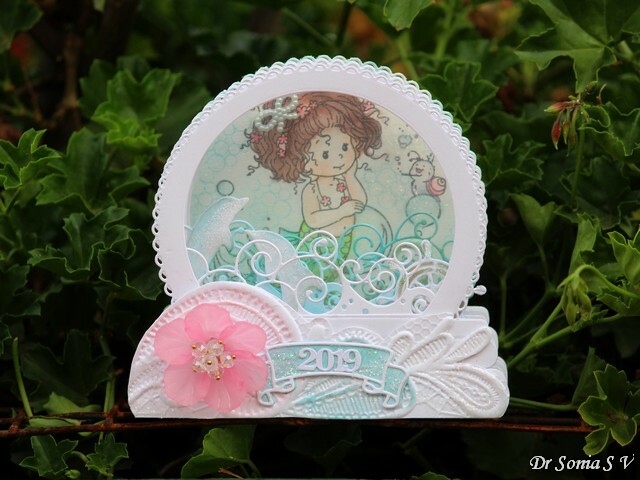 WCMD 2018 Dress Up Die Cuts Challenge with Gayatri- All the snowglobes are diecuts which are really dressed up by stamping and adding on more diecuts. 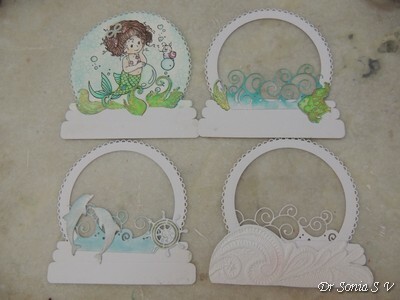 The dolphin, wheel and waves are also die cuts dressed up with Distress Inks and glitter. WCMD 2018 Ink Blending Challenge with Lea- used Ink blending with Distress Inks on the background and on the die cuts.